The Texas Apartment Association did more than “get by” the last legislative session—but only because we had a lot of help from our friends! “It takes a village.” A simple quote that everyone knows and which applies to a broad spectrum of things. At the Texas Apartment Association we know one thing for sure—we couldn’t do what we do without our village! With Texas’ 85th Legislative Session recently behind us, we’d like to take a moment to acknowledge the hard work and support everyone put into those 140 days on TAA’s behalf. Clay Hicks, CPM (Dinerstein Companies, Houston), Mark Hurley (Highland Commercial Properties, Inc., San Antonio), Dave Marcinkowski (Madera Residential, Lubbock) and Bill Warren (TAA Of Counsel) all took time to come to the Capitol and testify before House and Senate committees on TAA’s behalf. As did Howard Bookstaff (Hoover Slovacek, Houston), a.k.a. Harold Bookerstaff—ask him about his new nickname when you see him! Having local industry leaders tell the story of what a bill is trying to accomplish goes a long way when legislators are listening! TAA had an aggressive legislative agenda for 2017. Unfortunately, not every bill was successful but we had great bill authors and their staffs helping us out! Our main bill that passed—the water billing legislation—was carried by Sen. Brandon Creighton (R-Conroe), who had awesome support from his whole staff—in particular, Adrianne Evans, Tara Garcia and Patrick Tyler. Rep. Jim Murphy (R-Houston) sponsored the bill in the House, with his Chief of Staff Jason Briggs for the assist. Sen. Kelly Hancock (R-North Richland Hills) sponsored the city fee transparency bill and Rep. Tan Parker (R-Flower Mound) had its companion in the House. Adam Leggett and Paytyn Waltersdorf from Hancock’s office, along with Jordan Taylor from Parker’s office, played a huge role in this bill. Rep. Travis Clardy (R-Nacogdoches) and Sen. Charles Perry (R-Lubbock) championed our late fee legislation. Kelly Barnes and Jeff Carlson from Clardy’s office, and Robert Papierz from Perry’s office were all active with us well. Finally, Rep. Dade Phelan (R-Nederland) agreed to carry our bill cracking down on the falsification of the need for emotional support animals in housing scenarios. Zach Johnson and Madison Kieschnick from Phelan’s office spent a lot of time on the bill. We appreciate every member and staff who took on a piece of TAA’s agenda and look forward to continuing to work with everyone! Several other members of the legislature and their staffs worked on items outside of TAA’s agenda, and we are really grateful for their efforts. For example, Sen. Paul Bettencourt (R-Houston) spent an enormous amount of time on SB 2, which aimed to reform the property tax process in Texas. Rep. Barbara Gervin-Hawkins (D-San Antonio) authored HB 3473 in the House, which addressed criminal trespassing issues on multifamily properties. J.D. Pedraza and John Hawkins from her office were always very helpful. Rep. John Frullo (R-Lubbock) and Sen. Judith Zaffirini (D-Laredo) worked diligently to pass HB 2976 and SB 1501, which were incredibly helpful in the towing arena. Because of these bills, apartment community owners may now legally relocate vehicles from one place to another within their properties! This will be a huge time and money saver for all parties. Last but not least, TAA staff spent many hours working on lien law legislation in an effort to correct the bill’s language. TAA was joined by a group of interested parties (listed below) to kill a bill that would rewrite lien laws to require notice for all construction projects and provide limitless liability against all owners. 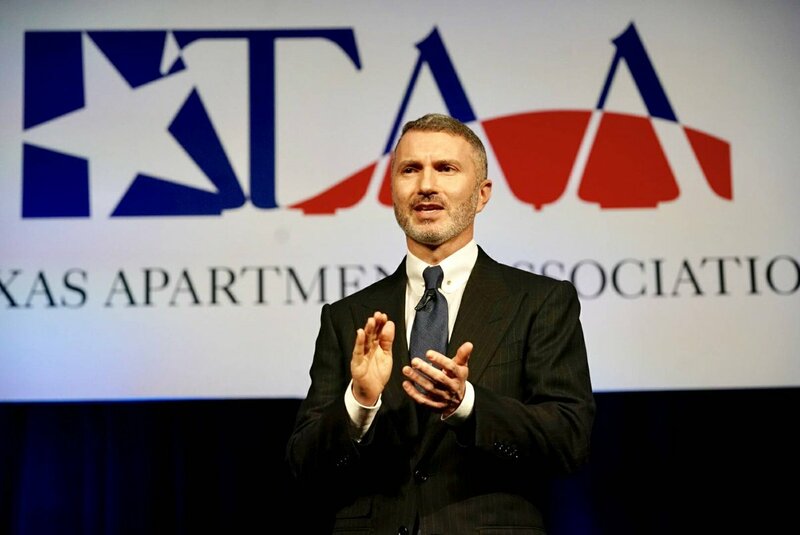 Almost 300 of TAA’s members from across Texas converged on Austin in February this year, and we couldn’t have been more excited about the record-breaking attendance. Together, you managed to visit almost every legislative office in the Capitol and conveyed TAA’s interests to Gov. Greg Abbott, Speaker Joe Straus and Lt. Gov. Dan Patrick’s key staff. And if that wasn’t enough, TAA NextGen members also shattered their previous involvement in the Day at the Capitol and made a massive impact at the Capitol! Josh Nichols (Fit Supply, Austin) and David Lindley (FSI Construction, Houston) were key players in rounding up participants—thank you both for your help! And of course, where would we be without involvement and direction from the Legislative and Minuteman Committees? Called upon usually with very short notice, these folks were tireless when it came to protecting your interests! Even with their busy schedules, committee members made the time to share their thoughts on legislation nine times for the Minutemen and eight times for the full Legislative Committee during session. Chairman Anthony Wonderly (Olympus Property, Fort Worth), Vice Chair Sandy Eckhardt (Milestone Management, Austin), and ALL members—thank you! TAA was lucky to have an extended contract lobby team this session as well, who were incredibly helpful in making sure we covered all our bases. Gardner Pate, Crystal Ford and Nef Partida of Locke Lord LLP, along with James LeBas of JL Tax & Fiscal Consulting, rounded out a great group of folks working for the industry. RealPage was also greatly involved in passing TAA’s water billing legislation; Lana Reeve from their team was generous enough to come to the Capitol twice to testify in support of the bill. We are grateful to everyone who was a part of the hard work put in this session! We have only about a year and a half until the 86th Legislative Session begins. In the interim, TAA will be working hard to protect your interests. If you happen to know any of the folks or trade groups recognized here, please be sure to give them a huge thanks for all they did to help us serve you in 2017!